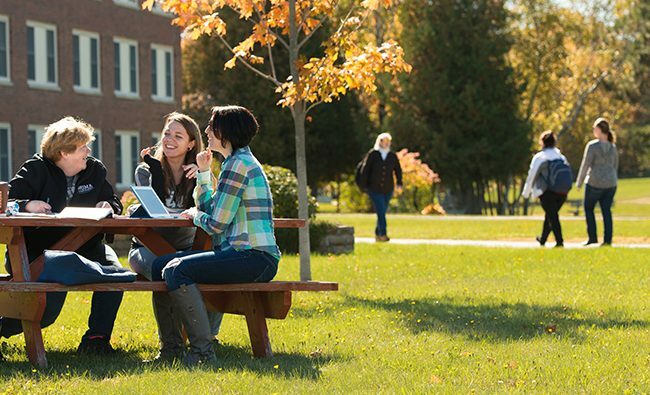 The University of Maine at Augusta is accredited by the New England Commission of Higher Education (NECHE). Accreditation of an institution of higher education by the Commission indicates that it meets or exceeds criteria for the assessment of institutional quality periodically applied through a peer review process. An accredited college or university is one which has available the necessary resources to achieve its stated purposes through appropriate educational programs, is substantially doing so, and gives reasonable evidence that it will continue to do so in the foreseeable future. Institutional integrity is also addressed through accreditation. Our regional accrediting body, NECHE, conducted a Focused Site Visit April 8-10, 2018. The NECHE Team was comprised of two members, Patricia Meservey, President Emeritus of Salem State University, and Scott Stanley, Provost of Granite State College. During this Focused Site Visit, the NECHE Team evaluated our efforts to improve student success, to reduce our students’ default rate, and to offer programming using the Second Chance Pell Program at the Maine State Prison and the Maine Correctional Center. As part of that process, we submitted a report on these areas. A copy of the report is found below.